Would you like to arrange a meeting, floating above Den Bosch with a skyline view and a full view at our St. John Cathedral? With it's separate bedroom, bathroom and living room and a second toilet for your guests, Our Duke Suite is the pride of The Duke Boutique Hotel. This luxurious suite is the ideal spot to meet for exclusive groups, board meetings or for special occasions. The Duke Suite offers all the facilities you need for a successful meeting: Illy espresso machine, tea maker, SMEG refrigerator, organic tea, Bollinger Champagne, lunch service when requested, water with mint and lemon, fruits and snacks, flipover and an extra-large TV screen which can also be used as a presentation display. The Duke Suite is available on request from €250,- per session including coffee, tea, fruits and water. 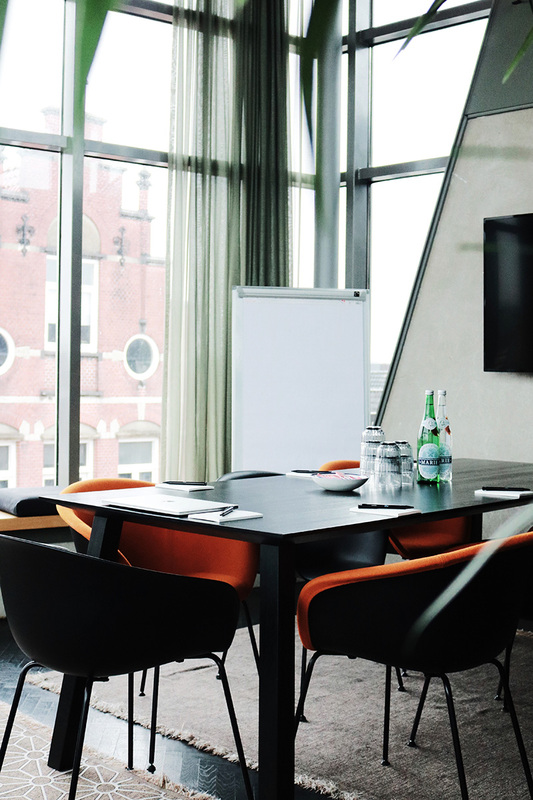 We can help you organize the perfect meeting, possibly combined with other activities and personal wishes.